Celebrated contemporary artist Louis Masai will bring fresh colour to conservation by painting a series of striking murals inside one of the world’s most iconic zoos, as part of the decade of ZSL’s (Zoological Society of London) pioneering EDGE of Existence programme. Created live in front of Zoo visitors from 5-20 July, his stunning murals will depict a selection of species identified by ZSL’s conservationists as being particularly Evolutionarily Distinct and Globally Endangered (EDGE), hence their loss would effectively mean the disappearance of an entire branch of the ‘tree of life’. Working in partnership with environmental organisation Synchronicity Earth and the #ConservationOptimism campaign, Masai’s fantastic artworks will be arrayed across the walls of ZSL London Zoo’s Nuffield Building – home to the Institute of Zoology, ZSL’s respected research hub. London-based Masai is a multidisciplinary contemporary artist who paints endangered species, using his trademark ‘patchwork’ style to convey the often complex relationships between humans and nature, and the challenges faced by these animals. Commenting on his exciting collaboration with ZSL and Synchronicity Earth, Masai said: "Over the past two years, I have painted all over the world, touching down on almost every continent. On that journey I have painted many endangered species threatened by factors of the sixth mass extinction – working with conservationists and activists as well as everyday art enthusiasts and gallery curators. I have even managed to at times meet the species that I have been painting. “This summer I will be painting back in London for the first time this year. I'm back with my good friends Synchronicity Earth and painting at ZSL London Zoo, which I have a multitude of respect for in its efforts to champion a new approach to conservation and the infrastructure of how a zoo works. 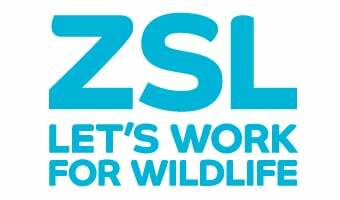 For this collaboration, I will be painting a series of murals inspired by ZSL’s EDGE lists, which will in turn become an education platform for the team at EDGE - fingers crossed these species have a better future. " Gharial (Gavialis gangeticus) – Slender-snouted, fish-eating crocodile once widespread across Asia but now restricted to a handful of rivers in India and Nepal, where there are believed to be fewer than 250 individuals surviving in the wild. Lake Oku clawed frog (Xenopus longipes) – Endemic to Cameroon, this amazing frog has 12 sets of chromosomes (compared with just two for humans), and faces threats including competition with introduced, non-native fish in its sole stronghold of Lake Oku. Philippine eagle (Pithecophaga jefferyi) – One of the world’s largest and most powerful birds of prey, this eagle was historically believed to prey exclusively on monkeys. Today these majestic birds face threats ranging from habitat loss due to deforestation and to extreme weather events like Typhoon Haiyan in 2013. Pygmy three-toed sloth (Bradypus pygmaeus) – These charismatic mammals can be found only on the tiny Isla Escudo de Veraguas, off the coast of Panama. The phenomenon of ‘island dwarfism’ caused by restricted habitat encouraged their evolution into the smallest three-toed sloth on Earth. Green sawfish (Pristis zijsron) – These incredible fish thrash their saw-like ‘rostrum’ from side-to-side to stun fish and dislodge prey from the seabed. Overexploited by humans for their fins (for shark fin soup), their trademark saws also make them vulnerable to entanglement in fishing nets or capture as novelty decorative items. Launched in 2017, the EDGE of Existence programme uses a scientific formula to rank the world’s most Evolutionarily Distinct and Globally Endangered species across a number of categories, while also funding early-career conservationists working to save these creatures in the wild through the international EDGE Fellowship scheme.